Blue traces are total accesses to all the tide-related WWW resources. Green traces are the number of actual tide calculations requested. Red traces are the number of requests bumped back because the server was being hit too frequently from a single IP number. Note that all bar charts are simply overlaid, not stacked, so the height at the top of each color bar is its value. Do not subtract the height of the next-lower colors (as you would if these were stacked charts). Data for these plots are generated directly by the WWW Tide set of scripts into a logfile format very similar to the standard HTTPD Common Log Format. The data are analyzed using an ugly custom script written in Perl. 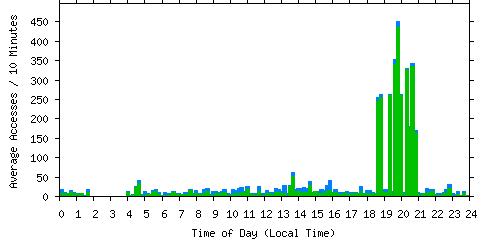 The plots are generated using gnuplot.